Gary Trent Jr., made two clutch free throws with 6.3 seconds left to help second-seeded Duke hold off the 11th-seeded Orange for a 69-65 chess match of a victory in the Midwest Region semifinals Friday night. All that talk about busted brackets and the maddest March ever – not happening in the Midwest. The win by Duke (29-7) set up a 1 vs. 2 showdown Sunday against Kansas, which also escaped with a four-point victory earlier against Clemson. Syracuse (23-14), the last at-large team invited to the tournament, saw its unlikely run to the Sweet 16 end – unable to overcome 16 turnovers against a Mike Krzyzewski-designed zone that was every bit as pesky as Jim Boeheim’s vaunted 2-3. Early in the second half, Krzyzewski tore off his jacket and threw it to the floor, calling a timeout after Syracuse scored two quick baskets to trim its deficit to three. Syracuse was looking for a near-repeat of two seasons ago when it made the Final Four as a 10 seed. This year, the Orange was an 11, but the Elite Eight already has one of those – Loyola-Chicago in the South. No lead ever reached double digits, and not until Trent Jr. swished his free throws was the game sealed for Duke, which will try to take Krzyzewski to his 13th Final Four. Tyus Battle led the Orange with 19 points. 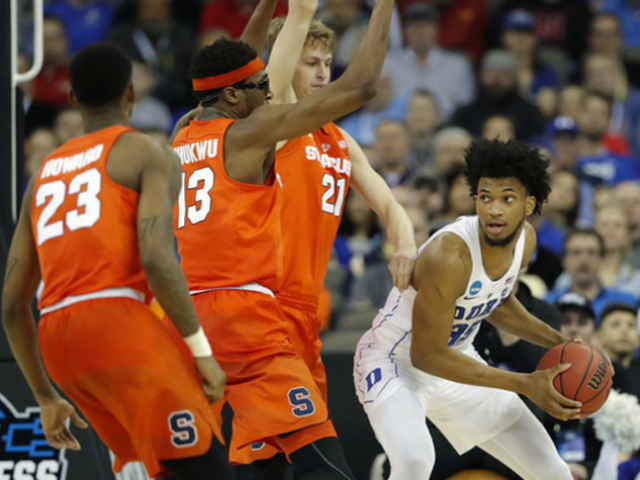 Syracuse’s 2-3 zone flummoxed its first three opponents in the tournament, but Duke found holes, throwing lobs behind Syracuse’s big men in the middle for layups and dunks. Meanwhile, Grayson Allen was quick to shoot the 3 in the second half. All but one of his 15 attempts from the floor were from 3. He went 3 for 14 from behind the arc and finished with 15 points. ”Battle is one of the best players in the country…He’s a big-time player. I love Tyus,” Coach K said. ”I love their team. I love their coach even more. He does such a great job with them.” But when asked about Kansas, Krzyzewski demurred, saying it was out of respect for Syracuse and his good buddy, Boeheim. Krzyzewski said he’ll talk KU Saturday.